When you come to Antalya, you’ll probably wonder, how big the city is (at the moment around 2 million residents – and counting) and perhaps – hopefully – you will also notice some of the historical monuments, that lies generously spraed around the city. 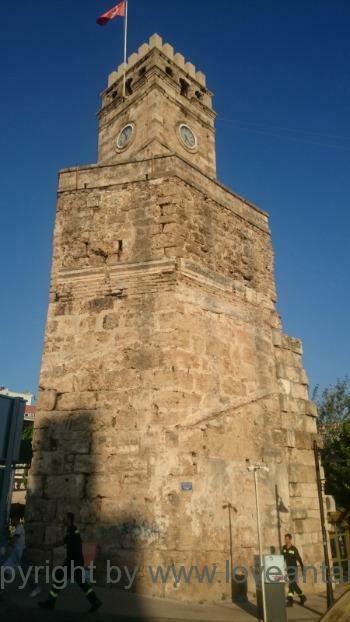 One of the old monuments is the historic clock tower, Saat Kulesi. Once an important part of the defense work (or Citadel) around Antalya. I have read, that there were once 80 clock towers connected with walls around the old inner-city called Kaleici (translated to “inside the walls”), but now this tower is the only one still remaining. The Clock tower is an important part of Antalya’s landmark, but is not as such a particular impressive building compared to others, just old, rough and beautiful. We have often used the building as a meeting point or landmark, when we’ve divided in several groups, walking aound in the city. And naturally, you’ve got to have a short look at the old tower and coarse stones, that has been there for over 200 years. If you want to find the tower, go to the east of the old town Kaleici. 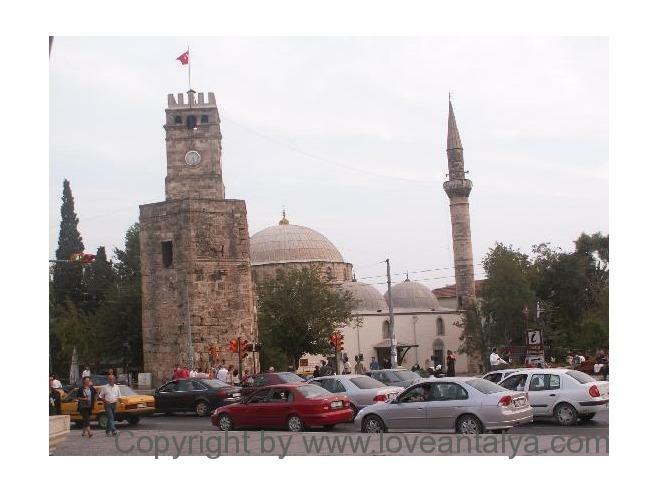 Saat Kulesi is located near Yivli Minaret (as you can see from almost all over the Old Town) and next to the beautiful Tekeli Mehmet Pasha Mosque. You can also go inside the citadel, as this Clock Tower marks the entrance to the old city – what a beautiful an pittoresk way to explore the old streets.